During the day Wendy “Bo” Mueller, 46, is a sales assistant in the advertising department of CableOne Advertising in Sherman. At night and on weekends she becomes Texoma’s newest soap star—mixing up batches of exotic, all-natural, aromatic soaps in her rural Denison soap kitchen. 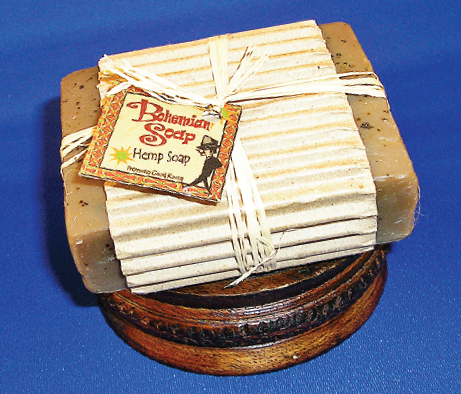 Bohemian Soap Company began three years ago using hobby store supplies and lots of experimentation. “I got my feet wet using ‘melt and pour’ glycerin soaps—adding essential and fragrance oils—then molding them using everything from Tupperware to gelatin molds,” says Mueller. Eventually moving up to “the real deal”—cold-press soapmaking using caustic ingredients—Mueller mastered the process of saponification as the fats, oils and lye solution come into contact and react. Mueller says anyone can get involved with soapmaking. The Internet provides guidance and access to supplies. But what eventually separates a professional soapmaker is the unique mixture of additives—the recipe— Mueller’s is classified, but she reveals that the basis of her successful products is the use of homegrown herbal Calendula oil. Husband Jack Mueller is in charge of cultivating the critical Calendula crop. “We lost most of this year’s plants during the floods,” says Mueller, “but we’ll plant in spring and be ready to manufacture again.” Jack also handcrafts the wood soap molds. The most popular selections for the guys are the Patchouli, Dragon’s Blood Resin, and hemp varieties. Those are manly-man mixtures in Mueller’s growing repertoire. “Women tend to gravitate to the peppermint, lavender and goat’s milk recipes,” Mueller notes. You can buy Bohemian Soap Co. products locally at Wild Lotus Beads, 613 W. Main, Denison, TX 75020. (903) 465-2000. Want to learn more about soap-making at home? Visit online for how-to information Texas Soapmakers Association www.txsoapmakers.org. Thousands of people make soap without mishap. In order to do so, you must be aware of all safety hazards. Children and pets should not be in the soap-making area or have access to stored soap-making ingredients, especially lye and essential oil.